Over 100 developers, planners, elected officials, and community advocates gathered in Boston last week at the 2018 LOCUS New England Leadership Summit to discuss innovations in smart growth and the future of development in New England. Massachusetts Secretary of Housing and Economic Development Jay Ash kicked off the summit with a keynote address, proclaiming that “all good development is local.” Throughout the day, attendees and speakers gave life to this statement, sharing smart growth strategies and challenges from their communities. Take a look at what attendees were talking about at #LOCUSBoston. Panel discussions throughout the day covered a wide range of topics, including best practices for smart growth in New England, transit oriented development, resiliency and Opportunity Zones. The diverse backgrounds of panelists, ranging from private real estate developers to elected officials and community advocates, ensured lively discussions and thoughtful questions from attendees. @BostonPlans Dep. Director of Climate Rich McGuinness says public-private partnerships are the key to building for resiliency #locusboston ie, private ROW and public investment working together. 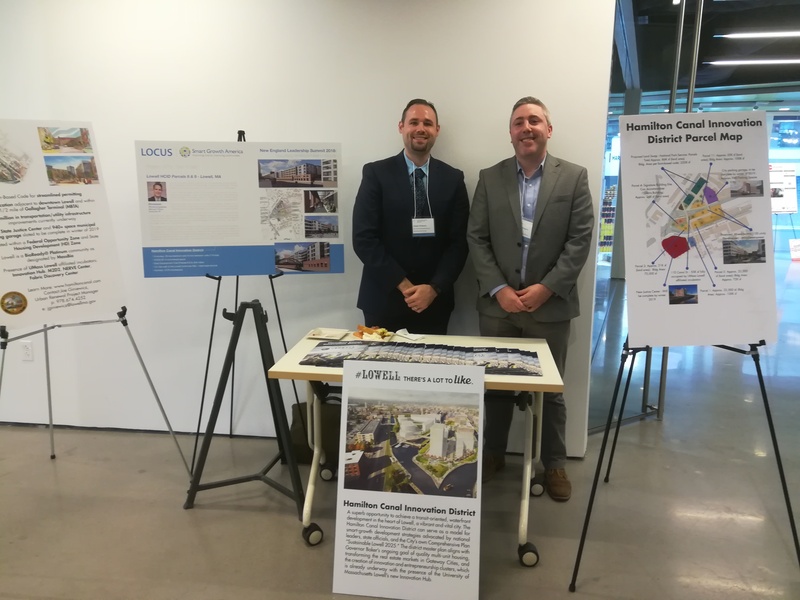 At the Summit, LOCUS, along with Tracy Hadden Loh from George Washington University’s Center for Real Estate and Urban Analysis, presented the top ten most investable Opportunity Zones for smart growth in Massachusetts. LOCUS will release a national ranking of all 8,762 Opportunity Zones by their smart growth potential later this year. Sign up to get your copy of the report here. Not only were there opportunities for learning, but also for finding new partners and jumpstarting new walkable developments. The Summit hosted the first ever New England Development and Investment Showcase, where towns from across the region, like Lowell, Massachusetts, shared challenging investment opportunities with real estate and economic development industry insiders. LOCUS and Smart Growth America also announced the winners of the 2018 LOCUS New England Leadership Awards for Project of the Year, Developer of the Year, and Partnership of the Year. Congratulations to the developers and community partners recognized for their commitment to creating thriving walkable places. Thank you to everyone who attended the 2018 LOCUS New England Summit!